Great Valley, NY - Margaret A. Chase ,96, of Great Valley, NY passed away Sunday November 11, 2018 at her home. She was born March 8, 1922 in Paris, Ontario, Canada the daughter of the late Reginold and Ada (Stafford) Smith. On May 18, 1940 she married Oliver Chase who predeceased her in 1998. 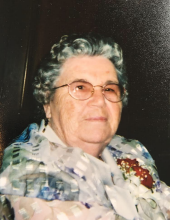 Mrs. Chase was a member of St. John's Episcopal Church in Ellicottville, NY and a Vestry member and Guild member at church, member of the Gowanda Women of the Moose, Ellicottville American Legion Aux., AARP , Ellicottville Vol. Fireman's Aux.and was Secretary and Treasurer of New Albion Cemetery for 25 years. She is survived by a son Alonzo (JoAnn) Chase of Caledonia, NY and a daughter Sheila Bockmier of Great Valley, NY and 14 grandchildren and many great grandchildren and great great grandchildren. Also surviving is 2 brothers Roy Smyth of Alaska and Norman (Jean) Smyth of Clintonville, PA and 3 sisters Norma LaCrosse of Springville, NY, Alice LaKavage of Texas and Maurel(Henry) King of California and 2 daughter in laws Penny Chase of Killbuck,Ny and Susie Chase of Great Valley, NY and several nieces and nephews. Besides her loving husband she was predeceased by 2 sons Loile Chase and Richard Chase and 3 brothers Fred Smyth, Arthur Smith and Reginold Smyth. Friends may call at the Mentley Funeral Home Inc. 411 Rock City Street in Little Valley, NY on Thursday November 15, 2018 from 4-7 pm. Funeral services will be held on Friday November 16, 2018 at 10:30 am from St.John's Episcopal Church in Ellicottville,NY. Burial will be in New Albion Lower Cemetery. Memorials may be made to St. John's Episcopal Church or Homecare and Hospice. To send flowers or a remembrance gift to the family of Margaret A. Chase, please visit our Tribute Store. "Email Address" would like to share the life celebration of Margaret A. Chase. Click on the "link" to go to share a favorite memory or leave a condolence message for the family.